Susan Howard launched her TapSnap franchise in style by doing one of her very first events with Coca-Cola at a major national conference. Coca-Cola brought TapSnap in for their booth entertainment at the Tailgate Party at the National Association for Convenience Stores convention in Atlanta. 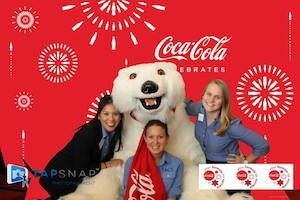 Guests had a chance to have their picture taken with a very special celebrity – the Coca-Cola polar bear. Everyone got to take home a print of themselves and their friends with the bear, who definitely stole the show. 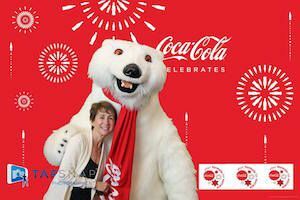 Coca-Cola used TapSnap’s green screen feature to digitally insert a custom-designed red and white background, which really made the bear stand out. The event didn’t use TapSnap’s full social media capabilities, but guests were able to visit Susan’s TapSnap Facebook page to get and share their digital pictures after the event, which turned out to be really great for her Facebook numbers. Over three weeks, the total number of impressions of any Facebook content from the event was a whopping 134,989, which means that nearly 135,000 items of social media content were shared during and after the event. A total of 56,834 people saw Facebook content from the event, and the viral reach, which is the number of people who saw page posts through a story shared by a friend, was 20,023 people. Coca-Cola was so pleased with the event they invited Susan to bring the machine in for a brainstorming session with the marketing and branding department to discuss ways they can use TapSnap to enhance their social media reach. Susan landed this event through her connections as the former Area Sales Manager for Convenience, Retail, Value and Drug stores at Coca-Cola. “I understood the customer and clientele, the whims of the convenience store industry, and I helped frame it a way that they could understand what TapSnap could do for them,” says Susan, who completed TapSnap University training in September.